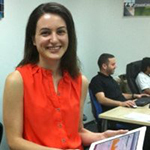 A short interview with Ravit Friedberg, Product Manager of Markets Pulse, an Enterprise Binary Option technology provider for online trading companies. "Markets Pulse provides financial companies with advanced binary options technology, offering a great addition to any online trading platform. The offering includes easy-to-integrate back office and technologically advanced front-end trading platforms. The technology is installed completely on-site, providing confidentiality of data and a customizable trading experience. Working with regulated companies such as FxTrade Financial and Gallant Capital Markets, the technology is also ready for regulation". "Markets Pulse has representative offices in the United States, Singapore, Japan and Israel and about 65 employees at its service. Our mother company is Jivy Group, an Israel-based technology company with extensive resources, and we support clients and traders across the globe". "The Markets Pulse technology is mostly used by brokers and other financial companies with an existing customer base, who utilize it to cross-sell their traders to this highly profitable trading product. These companies also require that this new offering works with their existing infrastructure. Markets Pulse is made for this situation; our technology was designed to seamlessly integrate with existing systems". Markets Pulse is an Application Partner of Weswit (for Lightstreamer). For what customers have you already deployed Lightstreamer? "We deploy Lightstreamer as an integrated part of our trading platforms and, as such, all our clients use the advanced Lightstreamer technology". "Markets Pulse is an Enterprise Binary Options Technology suite, which financial companies use to offer Binary Options to their clients without having to develop their own technology. The complete Markets Pulse suite is installed on-site; it seamlessly integrates with existing infrastructure and consists of intuitive front-end trading platforms and an extensive back office". "The Markets Pulse platform relies on Lightstreamer technology to distribute real-time financial quotes to all of the supported trading platforms: web, mobile devices and tablets. Real-time financial quotes are key to ensuring a dynamic trading experience for binary options traders". "Yes, the Markets Pulse Mobile platform is one of the only binary options mobile trading technologies that are native on both Android and Apple platforms. In part, the superior user experience is due to the reliable, low latency pricing pushed based on Lightstreamer technology". "At this time, Markets Pulse chiefly uses Lightstreamer technology to effectively and efficiently distribute real-time financial quotes to a variety of platforms". A concluding question for Rachely Esman (CEO of Markets Pulse) about Lightstreamer technology and its support team. We would be very grateful if you would like to provide a short recommendation to testify your experience. What benefits are you obtaining? [Rachely Esman] "The Lightstreamer application allows us to offer the kind of secure, scalable and reliable experience our enterprise financial customers need. Our cooperation with Weswit and the usage of their technology has played a large role in our leadership in the competitive Binary Option technology market". Lightstreamer 5.0 Colosseo is now available!